Just because...or every reason to send this fabulous mini cupcake tin. This sampler assortment keeps things interesting, and ensures the perfect selection to satisfy any sweet tooth. 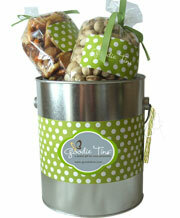 Perfect for birthdays, baby shower party favors, thank you or to sweeten the deal with an important client.